Mike Barnicle could be the early leader in the race for the lamest excuse for a Dem loss. On today's Morning Joe, Barnicle claimed that the death of Boston Mayor Thomas Menino "disrupted" the Massachusetts gubernatorial campaign, and that but for it, Martha Coakley might have "pulled it out." Really? Menino might not have been the most silver-tongued speaker, but the five-time Beantown mayor was a popular figure in the Bay State. It's not hard to imagine that far from hurting Coakley's campaign, Menino's passing might have prompted some sympathy votes for her, a fellow Dem. Yesterday the Supreme Court heard a case, McCullen v. Coakley, which calls into question a Massachusetts law which establishes a speech-free-zone extending 35 feet from the entrance to an abortion clinic. That law provides, however, an exemption for the speech of employees or agents of said abortion clinics, effectively serving as restriction on speech which is NOT content-neutral. "In 1984, Ronald Reagan won every Northeastern state. Since then, the leadership of the G.O.P. has systematically shed its idealists in favor of ideologues, reducing itself to the current Cheney-Limbaugh illusionati whose strategy is to exploit faith and ignorance by fanning fear and hatred. But, Northeasterners are not so easily duped. On Monday, the New York Times joined other media outlets in suddenly uncovering sexism in overwhelmingly liberal Massachusetts, after the shocking takeover by Republican Scott Brown of a seat held by Democrats for almost 60 years. Katie Zezima reported from Boston: "After Senate Race, Some Say Barrier for Women in Massachusetts Still Stands." Not mentioned in the laundry list of accusations of "macho" politics: The womanizing and worse committed by the late liberal Sen. Ted Kennedy. 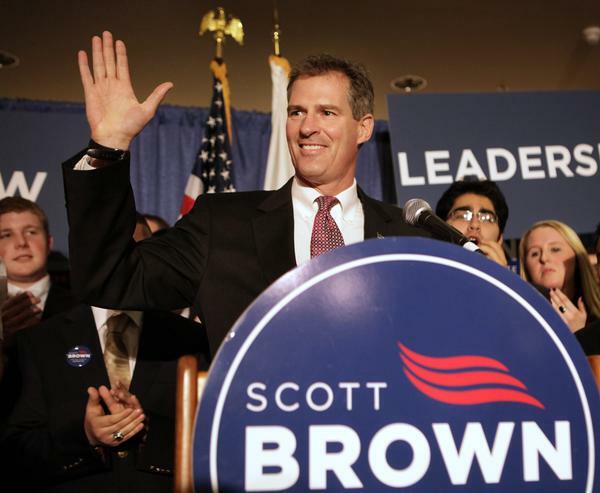 Building on Brad Wilmouth's critique at NewsBusters of Keith Olbermann's disgraceful treatment of Scott Brown's U.S. Senate victory in Massachusetts, Johnny Dollar (HT Taxman Blog) measured the coverage of the victory/concession speeches of Brown and his opponent Martha (or is it Marcia?) Coakley. During Tuesday night's coverage of the Massachusetts special election, CNN and MSNBC aired only a fraction of the Republican candidate's speech. Fox News Channel aired both candidates' speeches in their entirety. Barack Obama certainly didn't expect to receive as an anniversary gift a previously little-known Republican stealing Ted Kennedy's vacated Senate seat along with the President's precious filibuster-proof majority. But with Scott Brown's surprising victory in Massachusetts Tuesday night, that's exactly what the chief executive got 364 days after putting his hand on the Bible swearing to protect and defend this great land. As the Administration and its Party lick their wounds, the recriminations and finger-pointing have become almost as fun to watch as the returns were election night; the excuses for shoo-in Democrat Martha Coakley's colossal collapse comically traverse the political spectrum from the predictable to the theater of the absurd. O'DONNELL: Another interesting thing. You pointed out some of the odd things, talking about the availability of his two attractive daughters and also being willing to take his truck down to show it to the president and play basketball against him, but there was one part of the speech that I don't know if you heard. He said, our tax dollars should not be spent on weapons to stop them and not lawy-, let me start that over. Talking about terrorists, he said, our tax dollars should be spent on weapons to stop them, not on lawyers to defend them. 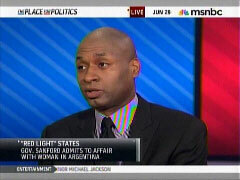 Newsweek's Adler Waxes Poetic About How Brown Got the 'Shmuck' Vote In Mass. Newsweek's Jerry Adler often waxes poetic on the magazine's The Gaggle blog in a feature called "newsverse." His most recent entry published yesterday evening deals with Tuesday's historic special election in Massachusetts, where Ted Kennedy's old seat went Republican for the first time in 58 years. 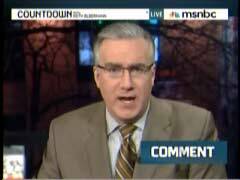 On Wednesday’s Countdown show, MSNBC host Keith Olbermann defended his recent attacks on Massachusetts Republican Senator-elect Scott Brown by insisting that some of the incorrect claims he made are true when, in fact, two are factually without merit while the third represents one of Olbermann’s typical episodes of distorting the words of a target. Among other complaints, Olbermann on Wednesday claimed that Scott "swore at" high school students at an assembly in 2007, that he has refused to renounce a vulgar threat made against Attorney General Martha Coakley by an audience member at a Sunday rally, and that he demonstrated racism in once suggesting that he wasn’t sure if Barack Obama’s parents were married at the time of his birth. The Countdown host repeated a myth promoted by the liberal blog bluemassgroup.com that, in February 2007, then-State Senator Scott "swore at a hall full of high school students" as he appeared before a group at King Philip Regional High School in Wrentham, Massachusetts. In reality, Scott was not alleged to have "sworn at" the students, but rather, he angrily responded to and complained about vulgar comments that some students had written about him and one of his daughters – comments which had been posted on the Facebook page of a pro-gay rights teacher at the school – as Scott read the uncensored comments from the site, naming some of the students, in front of the assembly. His actions sparked criticism because he read aloud the profane words as they appeared on the Facebook page, but he was not alleged to have "sworn at" the students. The super-sized, take-out-a-second-mortgage-to-pay-for-it bushel basket of movie popcorn just might not be big enough. War is breaking out among liberals, and the entertainment value might make Avatar look like a test signal. Just make yourself comfortable, sit back, and watch Chris Matthews and Howard Dean go after each other on this evening's Hardball. Dean was floating the absurd argument that by choosing Scott Brown over Martha Coakley, voters were sending a secret coded message that they really wanted a health care bill . . . more liberal than the current Obamacare version. Matthews calls Dean out on his lack of logic, and the pair wind up trading accusations of craziness. Is that the impression you're getting from some in the media regarding the results of yesterday's special election in Massachusetts? That's definitely the one Newsweek's Daniel Stone wants to leave his readers.